Sand making production line devices consists of vibrating feeder, jaw crushing machine, sand making machine(impact crusher), circular vibrating machine, sand washing machine and belt transmission machine,etc. With the characteristics of high automation, low cost operation, high crushing rate, energy saving and environmental protectiion, large amount of output, reasonable design and strong practicability. 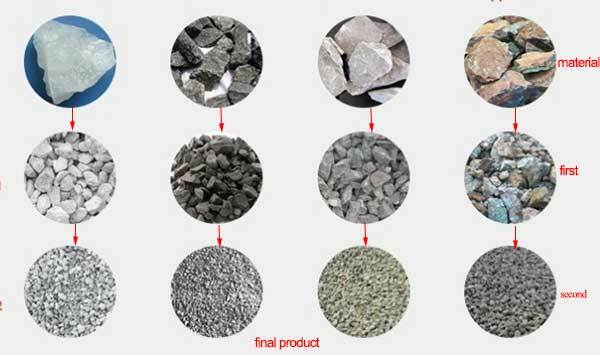 It is widely used for hard limestone, granite, basalt, pebbles, minging slag and other various material aggregrates and artificial sand making. Besides, it is widely used in the Mining, metallurgy, hydrapower, building materials, highways, urban construction and other industries. This production line configuration is suited for size of raw ore less than 400mm, and its specification of finished sand is not more than 8mm. With the addition of vibrating screen , it can screen various specification feedings, and the production is actual outpiut of sandstone(hardness level 2). The stone material was blasted from the mountain and sent it that less than 400mm to the vibrating feeder through dump truck. Then , the vibrating feeder evenly sent the graval material to the jaw crushing machine to carry out the first crushing. The broken stone material from the jaw is less than 70mm, and then it was transported by the belt conveyor to the counterpunch for secondary crushing. The crushing material would carry out the crush through belt conveyor sent to sand-making machine(raw ore that less than 400mm can directly crushed by sand- making machine).Finally, the finely crushed material was sieved through coarse vibrating screens for coarse sand, medium sand, and fine sand. 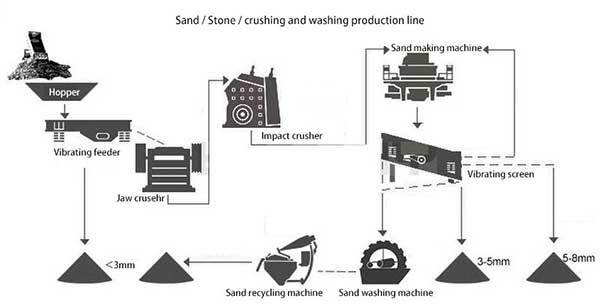 It is strongly recommended to add LZZG sand washing machine behind the fine sand for the strict requirement of sand powder content, and the waste water that discharged from sand washer can be recycled by fine sand recycling machine, which not only reduce the environmental pollution, but also increase the sand making production. 1. Large processing capacity and high output–50-500t/h, compared with the traditional equipment that at the same rate, its production has increased to 35%, and has stable performance. 2. Low consumption of vulnerable parts- The most ideal impact angle, the most reasonable impact speed, the most accurate design, and the most wear – resistant vulnerable parts, thus result in the effect that lower than 30% of traditional device cost, which directly reduce the cost of impact crusher and greatly increased the benefits of this machine. 3. Good shape particles of finished product- six-sided polyhedron and reasonable gradation, and specially suited for mechanical sand and stone shaping. Proved by the use of many customers that its comprehensive effect has increased by 30% compared with other same rate device sand making.